Light weight and high design flexibility make transparent plastic sheets attractive for use as “organic glass” in many different applications, e.g., noise barriers, green houses, sport arenas, sky domes, solar panels or bus stop shelters. In addition, rigidity and impact resistance of acrylic (PMMA) and polycarbonate (PC) sheets were optimized expanding its usage for safety and architectural glazing as well as for automotive, aircraft, yacht or caravan applications. Depending on the application, the transparency requirements will be very different and need to be objectively controlled – often within very tight specification. Sheets for outdoor use need to withstand extreme weather conditions and require high rigidity over a long lifetime. As an example, PMMA typically shows increasing haze with higher temperatures and therefore, limits its use in, e.g., automotive glazing where low haze is a crucial safety requirement. Material development has further allowed this behavior to improve and resulted in an optimized PMMA material with low temperature dependency ideal for automotive applications like rear windows. Automotive glazing is tested and approved in accordance to international regulations like, e.g., ECE R43 or ANSI Z 26.1 in regards to mechanical, chemical and fire resistance, and last but not least transmission properties. A critical behavior of plastic materials has been their limited abrasion resistance, which in many applications requires additional efforts, such as modifications of the polymer or use of appropriate coatings. 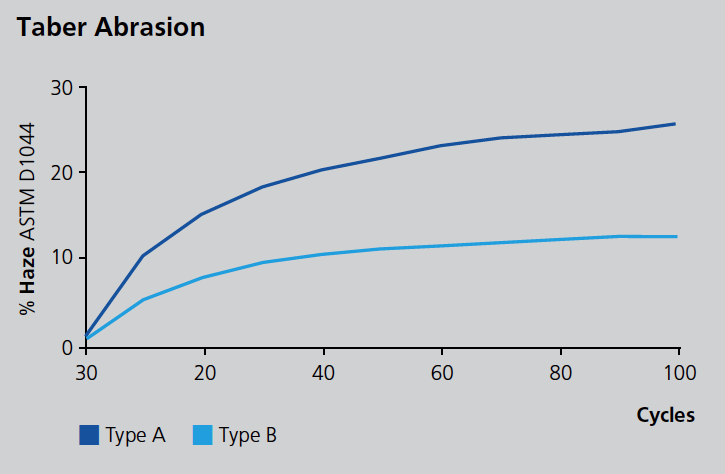 A widely used method for abrasion testing is the so-called Taber test according to ASTM D1044, where the sample is turned under abrasive wheels at defined conditions. After a certain number of cycles transmission haze is measured. To guarantee repeatable and representative readings, a special holder is available, which allows placement of the scrub mark exactly in the optical path of the haze-gard i. 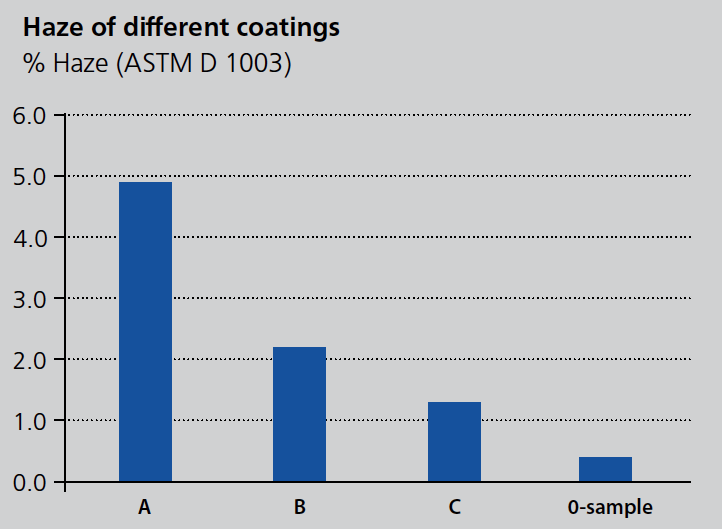 As an example, the graph above shows the abrasion results of different uncoated PMMA types used for public and sport glazing. In specific applications it is necessary to adapt a test method to the typical stresses during its real-world use. The wiper resistance test was developed to simulate accelerated abrasion by automotive windshield wipers under controlled laboratory conditions. 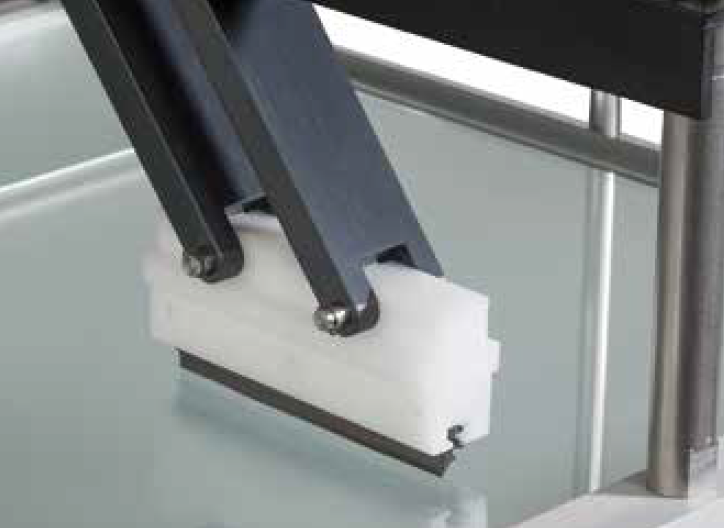 Instead of rotating abrasive wheels, a linear back and forth motion of a wiper blade is applied to the sample under test. The test specimen is placed in a box filled with a defined suspension according to ISO 12-103-1 A4 at ambient temperature. The complete test should be done for 20.000 cycles. After the test, the samples are to be cleaned with water. For the final evaluation, the transmission haze is measured with the haze-gard i. In order to generate a representative reading for abrasion resistance, the sample is measured at 9 positions within the center. Outdoor applications like noise barriers, solar panels or automotive glazing are expected to reach a lifetime of several decades. Harsh weather conditions affect the stability and the transparency of plastic glazing. Today a wide range of plastics is available from photo stable types to UV stabilized polymers. Nevertheless, natural and artificial, accelerated weathering tests are necessary to evaluate the impact of heat, UV light and humidity to the products quality. Therefore, transmission haze and gloss are measured after certain exposure periods. The following example shows the haze results of different polycarbonate samples after artificial weathering. As the degradation is usually not homogenous within one sample a statistical evaluation of several measurements is highly recommended. Additionally, only samples of the same thickness should be compared. Another critical aspect of weathering is the tendency of polymers to change its color mainly turning yellowish, which is typically caused by a reduced transmission in the blue spectral range. Yellowing is evaluated by measuring the color in reflection mode with a white background. It is recommended to always use the same backing and only samples of the same thickness. The spectro-guide – a portable spectrophotometer which easily can be used at the outdoor weathering station, measures the spectral distribution and the CIELab color coordinates. Often only the yellowness index according to ASTM YI E313 or YI D1925 is used as a quick check. In the following example, different modifications of polycarbonate were exposed to natural weathering for several years.